After an exhausting 26-hour Penang-Singapore-Taipei-Los Angeles journey (layovers included) and then another hour to drive south from Los Angeles International Airport, I finally made it back to my place (specifically my pillow) in Irvine, California. Sleep-deprived and physically-drained, I hit the bed and passed out slept for the next 12 hours. Waking up in my place in suburbia, I immediately felt the absence of Penang’s early morning chaos, energy and, of course, noise. This is hermetically-sealed Orange County after all. Drive everywhere in your SUV Orange County. Nearest corporate supermarket 3 miles away Orange County. No way I could just walk to the local coffee shop or roadside stall to buy breakfast today. Airplanes and cars are not the only way to travel. One bite and a quick sip of Malaysian Kopi-O (dark coffee) instantly transported me thousands of miles, and for a few minutes I found myself back home again. Ling’s layer cake is made-to-order. Please call at least 24 hours in advance. Thanks for the post. I haven’t had layer cake in the longest time…you are right about the smell…mmmmm. Back there edi so soon? Btw, haven’t tried this before. Thx for d shop’s info. I LOVe layer cake and tried some in Penang near Air Itam which was pretty good. I have to say though that the BEST layer cake I’ve ever ever had was in Amsterdam! OMG, I haven’t had this layer cake in a hundred years! I love, love, love kuih lapis!!! can we order the cake from the USA? will they ship it here? Omigosh, I had been looking for really good Layer Cakes for ages!!! Hey thx for the support on our Layer Cake. Hope to get ur order soon…. 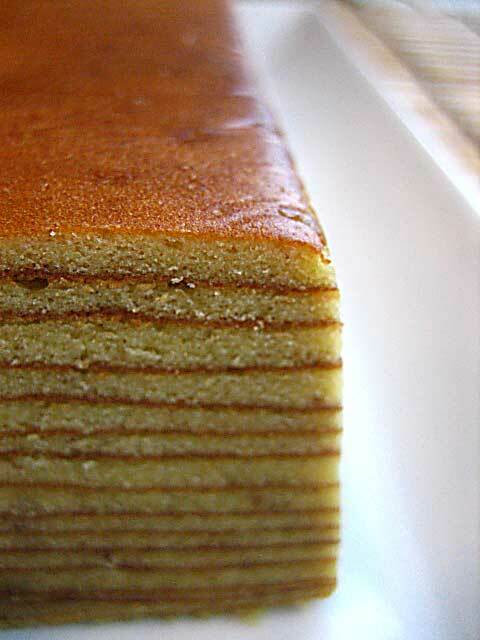 Come down to Penang to buy ur Layer Cake from us…..
Couldn’t agree more about the hermitically-sealed OC. I love your recipes. I am from Singapore, now residing in OC. BK – thank you, yes, OC is boring, I miss Penang! May I know how much Ling Homemade Cake charge for the whole kueh lapis? Hi. I chance this 5-year old entry which I hope is still valid. Talking about waking up to the smell of SARAWAK Layer Cake, we have posted on lot.my four types, we actually have 25. If at anytime u’re interested we’ll send you the catalog and the order form and we’ll get it to you wherever u are.